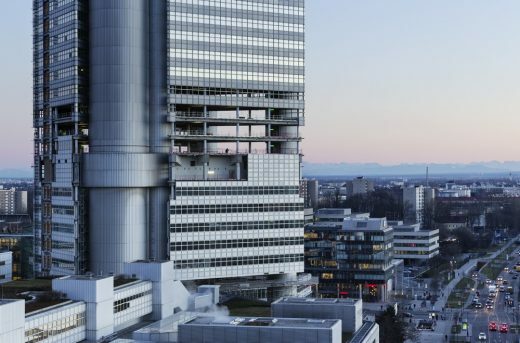 Its fascinating structure and appeal makes the HVB-Tower unique – a defining landmark which shapes Munich’s skyline. 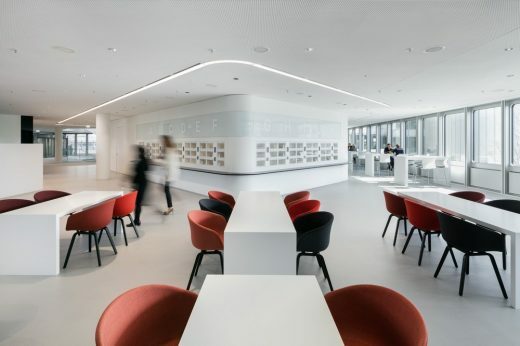 Based on a design by HENN, the listed building, which was the brainchild of the architects Walther and Bea Betz, underwent energetic restoration and comprehensive restructuring of the interior rooms. 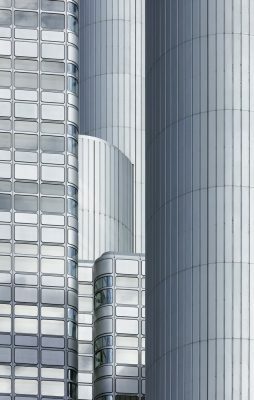 The particular challenge lay in the exact preservation of the building’s external appearance with a façade corresponding to the demands of a modern, energy-efficient building envelope. 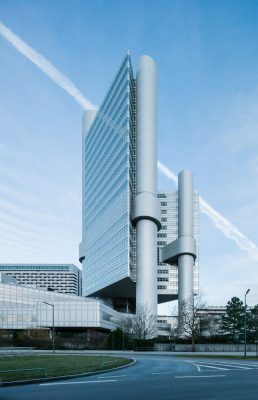 Since the building came into use in 1981, the Tower has undergone several changes before being declared a historic building in 2006. 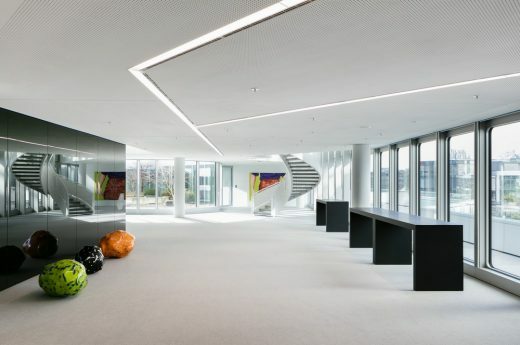 In contrast to the façade, the interior of the building was therefore no longer in its original state and could be completely overhauled during the course of renovation. 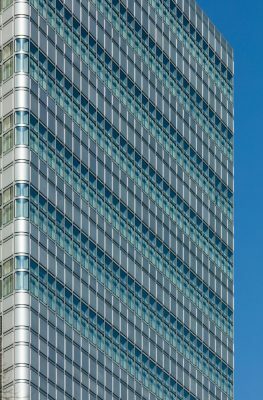 The formerly single-shell façade was replaced by a double-shell façade element developing towards the inside. The inner shell consists of an acoustically effective balustrade panel and an electromotive tilt opening vent with double glazing. This technology allows users to tilt and close the individual interior opening vents by pressing a button. Alternatively, the windows are opened and closed by means of a central control panel. The perforation of the façade elements for the fresh air supply was integrated in such a way that it is invisible from a distance. 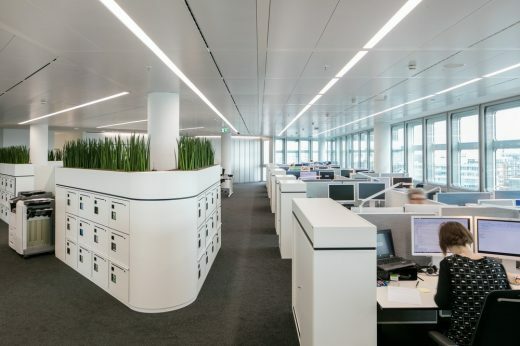 Refurbishment of the systems engineering allowed for the implementation of an up-to-date climate-control concept. The dismantled façade elements were sorted and separated. 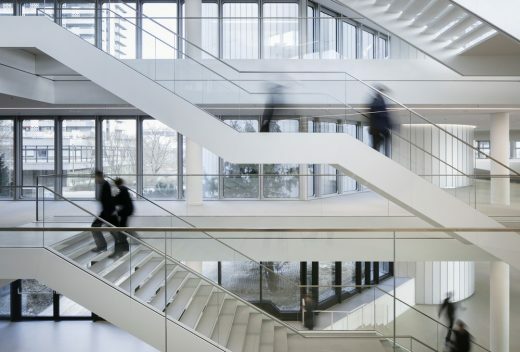 While most of the non-reusable parts were recycled, the aluminium balustrade panels were cleaned and reused. 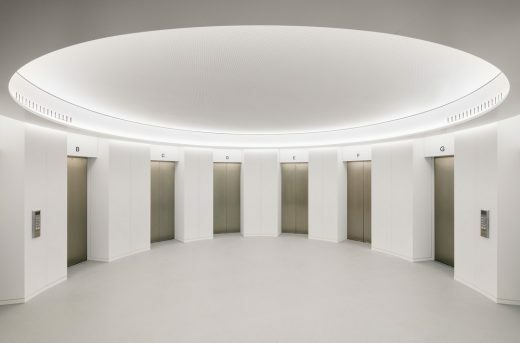 The building that the Tower rises from was given a newly designed entrance hall. 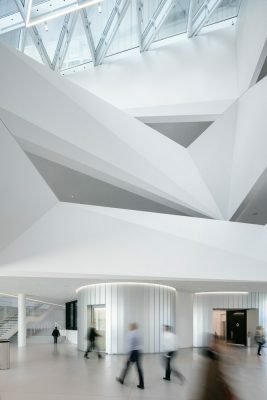 A spectacular space made from unfolded polygonal surfaces of varying inclinations and angles extends over three floors. 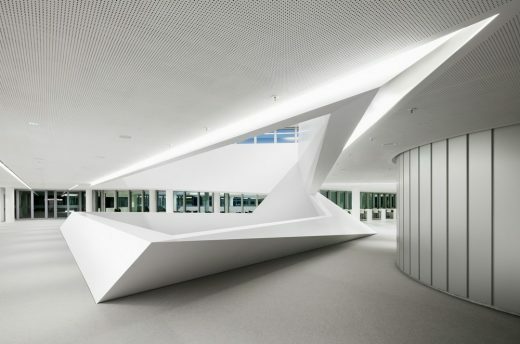 Through the triangular glass mono-pitch roof, daylight streams onto the matte white, solid surfaces of this crystalline spatial sculpture, creating changing lighting moods. 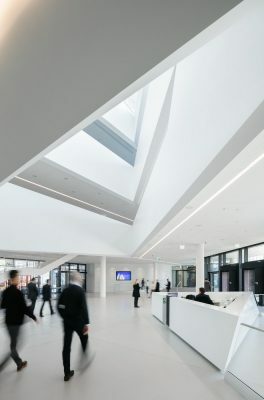 The sightlines between the floors connect the food court and the cafeteria on the first floor with the event area on the second floor, and draw the eye upwards. 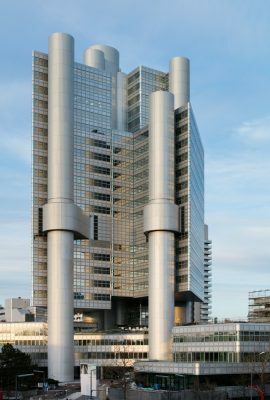 The offices of the 114 metre high HVB-Tower have been designed as open spaces with flexible workplaces. 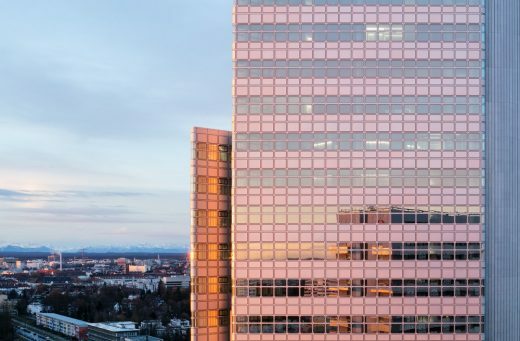 Due to the extensive energetic structural reinforcement of the façade, the use of environmentally friendly materials and the consistent use of renewable energies, the HVB-Tower was transformed into a „Green Building“ and received LEED Platinum certification.